Ladybrille Magazine Celebrates 4yr Anniversary, Honors Supermodel Nana Keita as Woman of the Month! Ladybrille Magazine, an online magazine established in 2007 to re-brand the negative images of Africans in the West, celebrates four years of carrying out its mission in its June 2011 Special Anniversary/Model Edition. To celebrate its four year anniversary, the online Magazine rolls out a special anniversary feature on Africa’s fashion models and names Supermodel Nana Keita, originally from Mali, as its Woman of the Month. The Ladybrille ‘Woman of the Month’ is a monthly feature on the online magazine which celebrates outstanding women, locally and internationally, for their brilliant contributions to society. Ms. Keita joins the Ladybrille Alumni list of brilliant Women of the Month(s) including Supermodel Iman, Saran Kaba Jones (Founder Face Africa), Teresa Clarke (Former Goldman Sachs Executive & Founder of Africa.com) and Currie Lee (Attorney turned Fashion Designer of the popular Asian brand D-Sata). 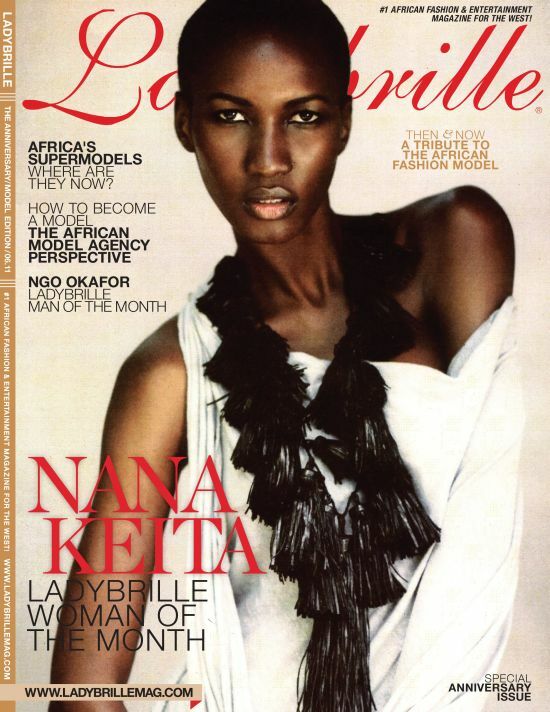 Supermodel Nana Keita’s feature will be published this week on the magazine’s website at www.ladybrillemag.com.